"When you taste wine, you taste with all of your senses," explains Andrea. There are many ways to taste wine. Probably one of the least preferred methods is to pull a Miles from Sideways and chug the spit bucket. It can score points for dramatic performance, but is not likely to get you invited to Aspen Food & Wine. Andrea Immer Robinson, master sommelier and author, is just the person to teach us how to taste wine … like a pro! It’s actually not hard and involves four steps — see, swirl, sniff, and sip — all of which she explains in this special Stark Insider TV segment. Even if all you have is a Dixie cup these tips will be sure to help you at your next office party, holiday gathering, or when you’re just hanging out with friends at a wine bar or a favorite restaurant. A proper wine glass, of course, does help, and can ensure you don’t channel your inner Geico caveman (as suave as he looks in a suit). And, remember — wine snobs not allowed — just because you can taste wine like a pro doesn’t mean you can’t have fun. As a matter of fact, discussing wine, enjoying with family and friends and discovering new food pairings is all part of what makes the experience so social! Part of the trick is to take your time. Tasting wine is about patience. I know you’re probably eager to Tweet your tasting notes el pronto, but first ensure you follow all of Andrea’s steps below to get the full joy out of your wine. Wine color can tell many stories. Aside from the obvious — red or white — the density of the color can indicate a wine that is bolder or fuller. Aged wines tend to turn slightly brown over time, whereas young wines will be brighter red. 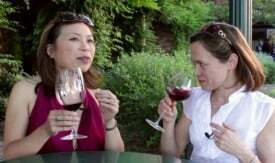 There are no hard fast rules here, but a lot of understanding about a wine’s characteristics comes from studying its color. Start today, and you’ll get better over time, and appreciate the nuances in each bottle you uncork! Swirling the wine in your glass helps aerate the wine. This helps unlock flavors and fill the headspace of the glass with aroma. This will prepare us for the next step. One of the best ways to swirl wine without splashing it all over your friend’s iPad is to hold the base of the glass and gently move it in a circular fashion on a flat surface. Now comes the fun part, tasting the wine. Most professionals swirl the wine around in their mouths. It can sound like a wet-dry vac sometimes. Why is it so common (and occasionally even theatrical)? Like swirling the wine in the glass (or decanting) it can help aerate the juice and unlock flavors. “It helps you appreciate all the layers of flavor,” says Andrea who suggests that you exhale through your nose after tasting. It will help give you additional details, it’s all about the olfactory nerve! Well there you have it. Four steps to tasting wine like a pro. The best way to get better is to practice, practice, practice. When it comes to wine it’s the kind of homework you probably won’t soon tire of. Be sure to follow Stark Insider on Facebook for the latest in food & wine.